Just four months after announcing its intention to transform photography, camera startup Lytro has announced its first product. The company's 'light field camera' may not look or work like anything currently on the market but, with an asking price starting at $399, it's clear that the company can conform to conventional expectations. Having given us an interview about the technology earlier this year, Founder and CEO Ren Ng was kind enough to show us the camera and give us an idea of what to expect. Ng has developed the company from the research he conducted at Stanford University. He's understandably upbeat about the launch of his first product and - unusually for a researcher-turned-entrepreneur - has a polished, soundbite-friendly way of explaining it. What does Camera 3.0 look like? 'We worked really hard to create an iconic design that really conveys the idea that this is "camera 3.0",' he says: 'We really wanted, in the industrial design, for form to follow function.' And, while we've not used it enough to say how functional its form is, the result is a device that, unlike many cameras, doesn't have any film-era roots to its design. The camera itself is a square prism in shape, around 11cm (4.4") long and around 4cm (1.6") square. Around two thirds of its length is bare anodized aluminum, which houses a 35-280mm equivalent, constant F2 lens. The rest of its length is coated in a soft, light gray rubber, in which you'll find the camera's three physical controls - the power switch, a shutter button and a slider that you stroke to zoom the lens in and out. All other interaction with the camera is conducted via the small, 128x128 pixel square touch screen that covers the rear face of the device. Two versions will be available - an 8Gb model that comes in gray ('Graphite') or blue ('Electric Blue') or a more expensive 'Red-Hot' 16Gb version ($499). The smaller versions will be able to record around 350 images, with the larger version finding space for nearer 750. The colorful aluminum and choice of capacities is immediately redolent of Apple products, and it's an association that presents itself at several points during our meeting. What is a light field camera? Just to recap, the Light Field Camera captures light rather differently than a conventional camera. 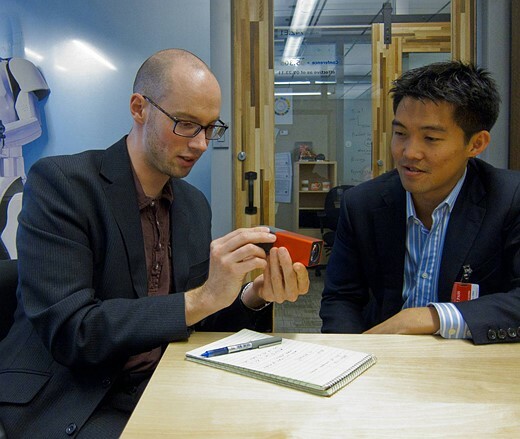 It features an array of microlenses set a short distance in front of the sensor. Instead of focusing light down into a single pixel as they would in a conventional camera, these are designed to split the information across multiple pixels, depending on the angle from which they've arrived. The point-and-shoot simplicity continues to the camera's interface, and again there's a hint of Apple about its simple touch-screen approach. Each time an image is taken, the camera animates its motion off to the left of the screen. So, without a hint from Dr. Ng, it seemed obvious that swiping from left to right would bring it back onto the screen (and it does). The rest of the interface is similarly straight forward - tapping a point on the screen refocuses an image, double-tapping zooms in, just as the images on the company's website do. 'Cameras are still really complex. Even simple ones have all sorts of modes and dials. We have two buttons, instant on and instant shutter - it's a device for capturing the moment, which is always fleeting,' he says. Unlike most contemporary compacts, the battery and memory are built-in and not user replaceable - the camera both charges and connects via a micro USB connector. Upon connecting, the full light field images (analogous to Raw files) are then downloaded to your computer. The versions of the light field viewed on your computer contain all the information captured when you shot the image and allow focus to be pulled continuously from the back to the front of the image. Beyond this, Ng won't go into detail about the cameras' resolution, beyond saying that these initial 11 megaray files will be 'at least HD' (1080 vertical pixels). And, he points out, because this just a different way of processing the light field data, it will be possible to present any images taken with the first cameras this way, once the software is complete (the company says the capability will be added in 2012). Shaking up the photographic market? Which raises an interesting point: how many people believed Apple had a chance of breaking into the well-established mobile phone market? And, while we wouldn't yet assume Lytro is going to experience that same level of success, we also wouldn't dismiss the company just because of its outsider status. The system still has some way to go to prove itself (we've yet to see production-standard images), but our first impressions are that it may well be able to capitalize on the huge levels of interest it has generated. It appears the camera is limited to web and email usage. There are no provisions or mention of printing, resizing and the use of other editing equipment such as Adobe, iPhoto, Aperture, LR, etc. There is no comment on the batteries life time or what happens when it is wears out. It also appears that you must have access to Lytro.com for its sharpening or focusing to work and that appears to be a variable since it can be changed. It appears that the adjustment of the Aperture on a regular camera may have similar results which can also be duplicated in the newer editing equipment. Also, some of the new cameras models have 3D capability so a comparison could be interesting. So it looks like an alternative to one button cell phone camera is developed, except it's less portable, less versatile, with lower resolution, and it will also cost a lot. I'm kind of doubtful there will be many takers unless there is something more compelling this article doesn't mention. Hmm... The device certainly seems interesting, but he mentioned F-book far too many times for me to take him seriously. That, and the device is Mac only. How about a little Linux love? Or at least Windows so I could Wine and dine it. Potential this has, but perhaps many years beyond present day. You haven't been reading this properly. They might be crazy, but not crazy enough to make it Mac only. They're just comparing several practicalities as well as ideas around this thing as being a similar business model to Apple's. Well, for now it is Mac only - according to the specs listed on their website for the device. However, Windows compatibility is coming. Compatibility isn't usually a problem for cameras, as no camera really needs to communicate fully with a computer's OS... But this one might given how reliant it will be on its own software since the picture isn't really a picture until post manipulation. Unless I'm just missing things entirely. Which, I should say, is possible. Since I have a Windows-PC and not a Mac, I don't think I'd buy the product today given the promise that the Windows version of the SW is coming in 2012. The SW may never come to the PC or it may not function well. Just because they can develop a new and unique piece of technology, it doesn't mean they know anything about developing applications. They may do that well too, but you need the whole package to make it work! We can complain about the look, the picture quality, the irremovable battery, the less of functions, or anything else. But we shouldn't complain about the concept, right? I still got hundreds of beautiful photos in my HDD without proper focus. It's my fault not doing focus right at the time I shoot them, but why don't I deserve a chance to make correction? If the "focus-after-shoot" concept can be improved and incorporate into our DSLR/EVIL/DC, what can the world be? It's funny seeing someone said users need to adjust focus one photo by one. I agree this generation of the camera may be weak in design. But how about if we can use "default focus" on shooting, and then go back home to check on the photos? If we find any one unfocused, we adjust them. The number of rework photos should be dramatically drop to 1/100 of total! If you look at the dissertation you will see he points out that this technology works to provide full depth of field without having to stop down the lens. So, you get to pick both focal point and depth of field in software, without having to decrease total number of photons hitting the chip. I see this as a potential tool for videographers looking for a variation on the "Ken Burns" look -- i.e. still images focusing back and forth, not just zooming in and out or panning right/left. Somehow I still believe that the trick is to "bracket" or "animate" the picture capturing in high speed frame per second (say, 60 fps with 60 different focus points, and so on). That's how they need a proprietary software to process it, to pick which "animation frame" has the focus point wanted by the photographer. No, what they do is put a microarray of lenses infront of the imaging chip and illuminate several pixels. Digital imaging processing then deduces where each ray came from. Then to get an image yoy ray-trace back in software. How the light camera serves its users? If I am a P&S user or a soccer mom, would I go home and refocus each photo I took today? This is an incredible burden to casual users. Besides, once you sit down to optimize one picture, it becomes a dilemma what would be the best. I saw so many lousy iPhone pictures. But, the poor quality doesn't bother the users because all the users care was they were there. If I am a photographer, I would spend time to compose the pictures. Seldom I would want to refocus the pictures. If I find it possible, I simply shoot a bracket of pictures with variable settings. So, who will buy a low quality camera if you don't want to spend 3 hours to refocus those 350 pictures you shot this afternoon? The idea is not that the photographer refocuses the image, it's that the viewer refocuses the image themselves. It lets people looking at the photograph interact (basicallyplay pull-focus) with the image. This camera, will change photography once they understand photographers ( serious and advance amateurs ). I can see everyone that are Facebook fanatics buying one of this cameras shortly. How many are now?? 500 million, if they could just hit 10% of those people, I think money is on their way. Let's buy shares, while those are still accessible. Good luck, but i will stick to cameras that i can be creative and express real emotions. A lot of discussion on resolution here. Keep in mind that "HD", whatever the standard may be, has traditionally meant 720p, 1080p, 1080i. Laptops with 1280x720 resolution are often advertised with "HD" displays. So I think the article jumped the gun and assumed it would be "at least 1080 vertical" because it could easily be only 720 vertical (still perfectly fine for web use). And 1920 x 1080 = 2073600 pixels. Thats slightly over 2 MegaPixels (Not 4 MP). Obviously if you have a 1920 x 1080 display, you could view the image 1:1, or 100%. Many people seem to forget that camera megapixel numbers are subpixel numbers which is not comparable to the resolution of a display. A full hd display has over 6 million pixels and to get that resolution with a bayer sensor you would need an 8mp sensor since the greens are doubled. However, there is not much chroma information at those very high frequencies, and modern demosaicing algorithms are very, very good. The information content in a 4000x3000 Bayer image from a camera with a weak lowpass filter (say, Olympus E-5) is almost as much as a 4000x3000xRGB image. we have zooms, we have autofocus, we have autoexposure, we have digital. 50 years ago noone had this, and when all of those apeared people laughed at the concept. leica laughed to the slr concept and failed big time. this is the future, deal with it. sure hope that nikon and canon goes into this and implement in their future FF cameras, or they will fail. 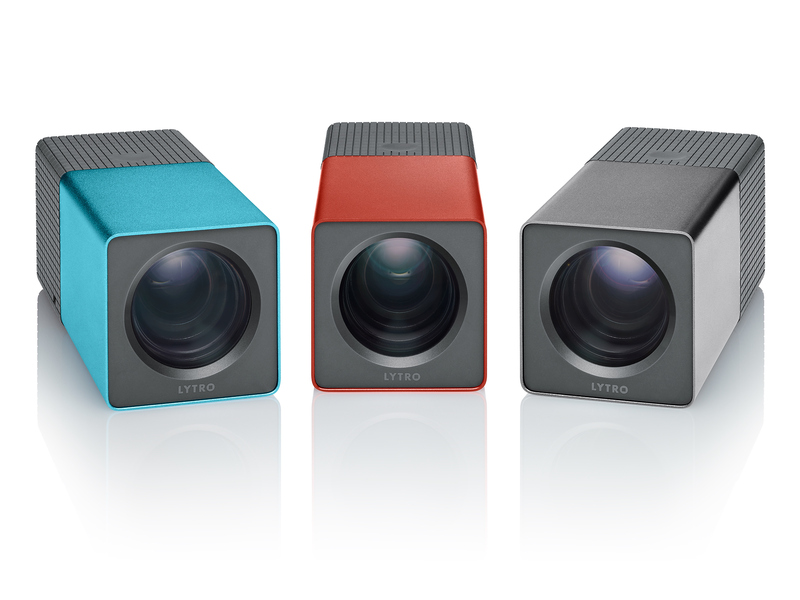 lytro, welcome, the world of photography is yours. Now, not everything new and different that has ever tried became a future success, did it? In fact, most things fail, the road to success is littered with scores of dead ideas. This one is just likely one of those. What? I don't know at anyone that laughed at autofocus, autorxposure or digital. Maybe absolute fools did, but I didn't and most didn't. There's no rational reason to think this is the future. The focus-less advantage is more than compensated by the intrinsic loss of resolution and light sensitivity. Period. Deal with it. Actually most people were sceptical of AF when it was introduced in the early 1960's it didn't work well at all, and it would be years before AF came to SLR's. Even then it was slow and you had to have lenses with big motor 'humps' on them, auto exposure was similar, early iterations of that tech were poor. Believe it or not I remember the Canon ION (early iteration of magnetic digital/analogue hybrid tech) which needed a PC to see the images– in the 1980's, early digital was far from perfect with 640x480 resolution and very expensive. Some of you have VERY short memories. Yes, Laica has failed. It wa dominant until mid 1950`s when Nikon took over the world of sports and news with Nikon F. Leica never recovered and never went to top again. MF and 8x10 Film users still laugh at digital and they do have a point. Same goes for autofocus, pros did laugh to the concept. Just wait till you see this technology in Nikon D6 or Canon 1Dx mk 3, it will be there in 10 years. what idiot at canon or nikon would go to a less than 1MP image? What idiot would buy that? NO leica was not dominant, ever. The article doesn't mention that if you live outside of the US, where so many great photographers actually do, you cannot pre-order this camera!!! I just found that out from their (very Apple-like) website. Nice... it would have been fun to play with the technology, and would have made a nice conversation piece as well! Too bad for Lytro in the end! They're currently pushing 3D as it's a marketing buzzword these days, but that's hardly the beginning or end. 3D doesn't interest me as much as one thing that comes to mind - shooting wildlife from an unmanned camera. If the wildlife is at a hyperfocal distance, no big deal, but in macrophotography? 3D is just icing on the cake. Shooting motion pictures without a focus puller (or auto-focus "hunt")? I'm sure folks in the surveillance biz are also thinking of this sort of thing. Fewer chances that all is lost for lack of focus, and one more chance to say, "We'll fix it in post-production." Should a company aim first for the pro business? George Eastman? Edwin Land? Pros undoubtedly sneered at their early products, too. Sometimes, one needs the consumer market to create a platform big enough for small-quantity/highly demanding markets. Online storage and viewing support? Woe unto them if they didn't supply a turnkey experience. It catches on? Then maybe they remove the handcuffs. I admit I was very skeptical about this technology in the beginning, but now I can see it was because of the lack of the real-world examples, and because of the lots of ramble and noise around the net, all created by assumptions and *without* a down-to-point, excellent explanation now presented by Ren Ng. Could anyone make sense of what an iPad can do for people if Steve Jobs did not present it so wonderfully and made people crave for it? In that same manner, kudos to Mr Ren Ng. In this way or another, his ideas will change something inside the world of photography, same as the original Mac did in the computer industry. Except for the small box, the tech is not original to Lytro. I just tried to reserve my order and couldn't even sign into my Lytro account which I created months ago. Lytro needs to be real clear about resolution; a 3 or 4 MP resolution will do for starters. Though that's a cool point about holograms. I wonder if they'll release the software to do those from these images. If this product takes off, much like the iphone4..There will be grips, handles, jackets cases..you name it. I have much confidence this will be a curveball thrown at the industry. That is just a Apple fan that made a thing thinking about Apple. Not quite, but is that bad? After all Apple are the biggest tech company in the USA and I think have the highest value based on stock–I'll take that kind of success. When can I expect the IPO? "Rather than dwelling on resolution, Ng is keen to highlight the 3D capabilities of the light field approach. Because the light field retains information about the direction from which light has arrived, it has inherently captured three dimensions of information. Although not supported at launch, Lytro is able to show demos of images where the initial viewpoint can be moved around. 'We can change the viewpoint,' he says: 'which is unique to capturing light fields. They're effectively digital holograms. We've actually had holograms made from light fields - this is what the directional information can do.'" I'm looking forward to this way more than being able to click on various focus points. Sorry Dr Ng, great tech, but people won't buy into this business model. You may think that people won't buy the product, but the business model is mostly good old design product / build product / sell product. If you think there's no market for Facebook pix, I would seriously argue with that. As far as the image storage in the cloud, it's a little unconventional (currently), but as long as there is no fee, it will work. I also think that cloud storage is a temporary feature of the product - it is clearly there to protect IP in the short term. I think there is real technical merit in true 3D data capture here. If you could accurately capture the geometry of an object with a handful of exposures, there's huge value in that technology. wander - no, cloud processing is necessary - there are (latest specs) 11 focus points that are matrixed in the microlenses and using the cloud processing you choose which you want to see. All the stuff he is talking about (3d, etc.) relies on heavy software on heavy iron - mainframes! For the first implementation of this....it's akin to the early stages of consumer digital cameras. Remember those.... 640x480 pixels. Good for web use but not so much for print. After looking at their examples, the ability to change focus point is nice, but the resolution only works on the web. Therefore, implementing web based use is the only practical way to view the images. No prints....just pixels on a screen. For those of you looking for this to be something to use professionally, you're sadly mistaken at this point. I would think that a specific focus point could be choosen and then the image could be saved as a jpeg - or am I wrong? If combatting shutter lag means something and/or the bulk of that hefty DSLR is getting you down, why not give it a chance? I would be willing to try it, especially if I can view/display the images on a smartphone. It takes guts to tread into this saturated and hyper-competitive domain with what seems a new idea. Dr. Ng earns points for this courage and I wish him success. I like the tech, I don't like the implementation or the form factor. - Proprietary software needed, so toss your existing workflow out the door. - The requirement to share photos on their site too limiting. - From the photos I've seen, you can't really call any of them sharp. I think the tech definitely be around in the future, but this form factor and implementation have a lot to be desired. It seems more like a gimmick than a serious product. This may be a limiting initial attempt, however, I believe that this technology is not only here to stay but it will change how ALL cameras are built! Not having to focus isn't just about time delay, shutter lag, etc, it's about building lenses in a completely different way! It'll mean, smaller cameras, smaller, faster, cheaper and better lenses, much faster operation, and therefore, more successes than failures. The days of out of focus, but otherwise, perfect shots will soon be over. I just hope they'll sell enough of these to keep them going. "It'll mean smaller cameras..." - the Lytro, with its stacked lenses, is something like 5 inches thick! Won't this get even bigger if they eventually give it bigger sensor and zoom capabilities? My thoughts exactly... maybe they're aiming for the grass roots first? The point and shooter before moving into higher end markets? I think this is the test version of something big. I wouldn't have bought a 1st generation compact interchangeable, but now they're getting better. This camera has its limitations, it isn't pro ready, but I has potential. give it a few generations. the lens is already set so the optics can be AMAZING. F 2.0 means a fast shutter speed even for big DOF. Once they give us control over shutter speed, iso and give us a higher Mpix sensor then you can do anything with your shots. People are put off by decisions made by the company, not the shortcomings of the technology. It's too much a hefty block for the ordinary consumer while it doesn't provide image control for the enthusiast. An 1MP is too little for a pro. well 1920x 1920 is more than 1 MP, its almost 4MP. HD is 1920x1080, which is 2MP. If its square images like the samples, he implies it is 1080 vertical = only 1.1MP. Which is still plenty for lots of web uses. I think it was explained. A tripod is unnescessary because the shutter 'happens' instantaniously. yeah, but for how long of an exposure? The captured file is in a RAW format. Provide a way for the user to output the user tweaked file into a JPG file and this would be really super cool. 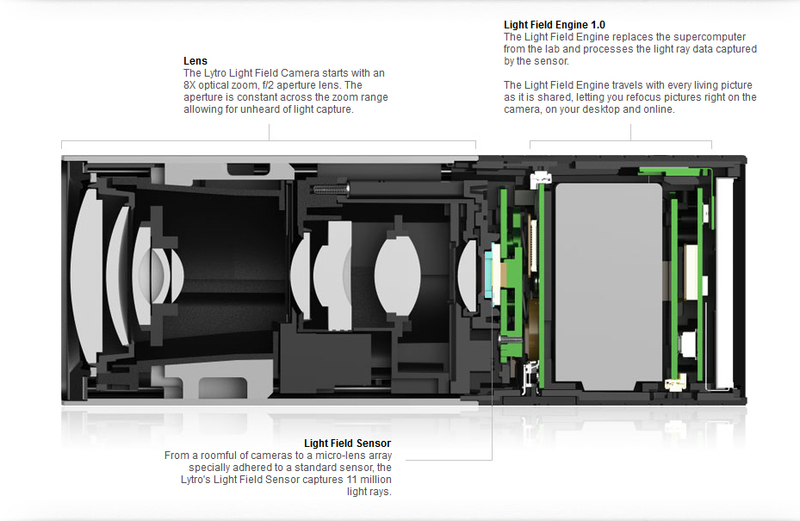 If Lytro won't allow that simple thing, I am not a bit interested. Sorry. You want to be able to save 2D versions of an essentially 3D image? Would you not be better off just using a conventional camera at that point? ...I don't think that's what CLT is trying to get at. I think the main question is: will this be a format open to Adobe and other 3rd party post processing software developers? The data output by these sensors has all sorts of useful applications that probably extend beyond the creativity of even the people who build the hardware. Will they provide software solutions that can be integrated into existing workflows (eventually), or is this something that will be tied down with proprietary software, and only a fun toy? Will there be an API/SDK? With all due respect, Mr. Butler, I thought this was supposed to eliminate shutter lag and missed focus opportunities which abound in the "conventional cameras" you speak of. Point, shoot, determine focus point later...this is on their website. "You can refocus your pictures at anytime, after the fact." I think it's brilliant technology, and I do hope that everyone is wrong and a "2D" JPG of MY picture with MY chosen focus point can be saved with their desktop software. I do understand that viewing the "3D" image the way they describe, hosted via their servers, is acceptable because it requires special software but I cannot buy in to a company that will lock away my images and only allow me to share them how THEY see fit. What if they go out of business? What if they are slow to update their software for new social media sites and technologies? I don't think asking for the ability to save a JPG is asking too much. I don't think it's asking too much, but it's a little bit like saying you won't buy a camcorder unless it'll do frame grabs. Either way, in the previous interview they did, they made clear that the were creating an API and hoped that, in time, there would be a way of editing the images in software such as Photoshop. With FujiFilm Real 3D W3, yes you can. Output other images also, like anaglyph, left and right image side by side, individual left or right image, etc. And it does video in 3D. I would like to point out the FREEDOM to create and output images. Right now, there is no such FREEDOM. 1. You take a photo. 2. You can't share it efficiently unless you upload to Big Daddy up in the sky. 3. Big Daddy OWNS your image, HOLDS your image, KEEPS your image. Too big a shackle to enjoy new tech offerings. @R Butler: save 2D of a 3D image? It wouldn't be too unlike having a new camera that could do "bracketed" exposures, so that way you could have one photo of the 9 exposures you like best. Let's pretend no program can open up more than one photo at a time. So you have to use the company's server to "view" the 9 set photos. We just want the ability (freedom if you want to call it) to be able to have a single photo from hardware that makes it easier (bracketing or Light Field). I don't think you'd be too keen on not being able to save a page (let alone a whole book) out of an "interactive novel" you typed onto a "cloud" server from a special typewriter. The whole concept sounds pretty neat. I would be willing to try one. However, the fact that I can't share my pictures except by going through their website is an absolute no-go. I'm sure I'm not the only one who feels that way? Was interested until I got to that bit. I'll disagree with you. Every single serious photographer (those who make money with their skill) has a facebook fan page. There are literally millions of photographers on facebook, more so than any other site and many use it to promote themselves and sell their services. One only needs to head to google and type this in "facebook photography marketing" to see that in deed, you are incorrect in your statement. Not have access to the raw data and copy of the image is a non-starter. What happens when this company changes strategy, goes out of business, or has a software error that wipes out their database? Do you trust to have your only copy of your business or your priceless memories stored by an unknown company ? Big fail! They want to copy the Apple ecosystem. Fine. iTunes allows you to down an MP3, and your app, and your book. Don't get me started about how well would I trust to have the only copy of my family pictures held by an unknown entity without a personal backup. on the other hand what kind of a fan could look through all of you're 100,000 images. A average viewer's attention span is good for 20 images max. unless they think you're a genius and return to your site. I think this the technology has a lot of possibilities, however the implementation seems to be misguided. WHO OWNS THE IMAGES PRODUCED BY EACH CAMERA?? The Photographer? Lytro? Media provider? etc...The owner usually is the sole beneficiary and bears accountability for the output of this device or is it? With this new workflow, it seems that the photograher is now only a part owner images produced. I think we are only seeing the initial form of this technology/product. I think it has a long way to go. I wonder if this would work or maybe in use for surveillance - the form factor kinda looks like those surveillance cameras??? How about Satellite Cameras looking down on us?? I am sure industrial 3D applications are just around the corner - semiconductor production and testing applications others. @CBuff: exactly my point. I don't want some company to possess my pictures. And if they managed to get this camera made, it shouldn't be such a big deal to make an application to refocus. I sincerely hope it turns out well. I suspect it'll end up like the Wankel Rotary Engine - a niche thing, with fans - but it's nice to have a bit of diversity. I can remember when the possibilities of digital imaging seemed endless, but over time the technology seems to have homogenised, with most of the effort going into the packaging; if this could be made to shoot video the results would be beautiful. Although I worry that the technology is too complicated to add to an existing imaging system, as a kind of added ingredient, and conversely too esoteric to capture a mass market. I wonder if it could be built into lenses, so that e.g. you could stick a 70-200mm f/2.0 Selective Focus lens on your Canon, or what-have-you? This is done at the sensor level. I believe there have been designs that could be built into a lens, but I don't imagine they're easy to retrofit. Since this is sensor level, it should work with existing lenses. But it looks to be built onto a small pocket cam sensor currently. The camera that created all the buzz around this tech a few years back was a retrofitted medium format camera, so it can certainly be done. But it takes either additional on board or outboard processing, beyond what's already being done. @Ashley Pomeroy: I fear it will be less like the Wankel Rotary Engine (which is still available from Mazda) and more like the Nimslo 3D camera of the 1980s. There are too many restrictions and not enough user control, plus a 1 MP camera? Seriously? I got rid of a 1 MP Sony Mavica a long time ago. I was excited about the concept until I find the resolution is crap. I thought I could take the picture and adjust the DOF later and print what I decided on later- I can't do any of this with a camera like this, not to mention be able to tell what I am framing outdoors on a sunny day. I'll take my $400-500 and put it toward a fisheye lens- I'd use that more than this....what a disappointment! It's 4MP... it's more than your monitor can show! At first, I thought, man, this is a good idea. Think how great this would be for crime scene investigators, private investigators, people who use cameras for evidentiary proceedings. Then, darn it, I saw it was tied to a service back on their company servers. That's no good at all. People who collect evidence need a chain of custody. Sending it into some cloud service instead of keeping it down on a local server defeats chain of custody. I need to keep all my originals in-house. In evidentiary discovery, I need to be able to hand off the files to the opposing counsel without having a cloud service do the interpolations for me. I applaud the product, but this is nascent and will get better when some of the delivery aspects are resolved. I suspect we'll see that solution when Prof Ng licenses his patents to Canon or Nikon. The "resolution" is still not disclosed and is probably dependent on a number of factors. And don't forget that there can be a large difference between "output size" and "resolution." This is a camera enthusiasts site. Most users here aren't the target group and won't get the appeal of it. This is a Facebook camera for Facebook people. If it catches on, these people will be rolling in it. Megapixels just don't enter the equation at all: it's all about if the product is 'hip' or not. And having to focus after the fact? Nah, there's no reason to believe that it doesn't autofocus just as well (or much better) than a regular P&S. I may be wrong but I think the reason why the pictures are hosted on their site is because it's their servers chugging away with the convolution data. Even if the pictures were viewable on a desktop, a smartphone probably wouldn't be happy with the processing. With as many users Facebook has worldwide I don't see them even having a need to market this to photographers. This is strictly a niche market item aimed exclusively at Facebook users, with a huge market base. If they sell to just 1% of their market then they are multi-millionairs. They could easily surpass regular point & shoot sales for any camera maker with this technology just by limiting their marketing to Facebook users, that just like Apple users, have to have the latest Facebook technology tool. Then for those that want a print there is always just taking a screen grab. At this low resolution printing wouldn't be any better than a screen grab anyway if printed bigger than about 2x3.5. 2MP x 9 ~18MP, not bad huh? Did they forgot to tell you that? I'm both amazed and amused at many of the above comments - why ? - well I've heard them before when consumer digital cameras first were sold. Remember ? - poor quality, costly, never be as good as film, never catch on - we had them all - now my phone can do 8 MP, and Polaroid, Ilford, and maybe Kodak, are gone. Sure looks like electronic focus stacking to me. The resulting captured file is very large, and one only ends up with a low-res derivative, currently only able to be processed by the manufacturer. And these are not small files one will be uploading to Lytro. An innovative concept, but will it be successful in the marketplace? Any word on the duration of the exposure (shutter speed). Lytro CEO Jason Rosenthal has acknowledged that the company made a 'small number' of layoffs earlier this year and that there are some 'kinks' to be worked out with its unique 'light field' camera. 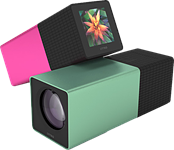 Meanwhile, according to an article by tech blog SFGate, industry sources report that the Lytro camera 'isn't selling well so far', due to its price and lack of appeal to professional photographers. Rosenthal is, however, bullish on the future of the company, promising 'multiple [...] breakthrough products' in 2014. More details are available after the link.